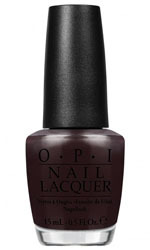 OPI has a selection of dark shades will not disappoint. Choose from a selection of dark reds, midnight blues, emerald greens and deep amethysts, perfect for those who want to swap their whites and brights for moody darks. Boy meets girl, romantic nights ahead. Basic black and basically fabulous, rich in colour with the long lasting wear of a gel manicure. Where midnight meets purple, rich in colour with the long lasting wear of a gel manicure. A luxurious deep black with glints of glamour, rich in colour with the long lasting wear of a gel manicure. Wait until you see this deep sea indigo, rich in colour with the long lasting wear of a gel manicure. A deep purple for a divine diva, rich in colour with the long lasting wear of a gel manicure. Go black and bring out the vamp in you!